Y Griega is a feminized sativa dominant Marijuna strain. It is the strongest cannabis strain available in the Medical Seeds catalogue.Energetic effect at the beginning and very smooth after. Ideal as a medicinal plant. 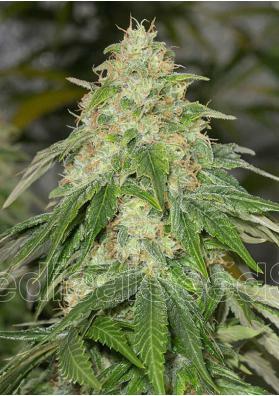 Y Griega is a feminized sativa dominant (80%) Marijuna strain created by crossing Amnesia and Kali Mist. It is the strongest cannabis strain available in the Medical Seeds catalogue (about 27% according to studies by Canna Resort), being specially recommended for medical users to treat diseases like glaucoma, inflammation, chronic pain, fatigue or lack of appetite. Its flavor is typical of Haze varieties, combined with sweet undertones that make it more original. The effect begins with a strong energetic feeling that slowly changes into a state of alert relaxation. Y Griega starts its growth with a spectacular vegetative vigor being able to reach 3.5m tall, so it is advisable to grow it in SCRoG to control its height. It produces heavy, large and extremely resinous buds, an atypical feature of the sativas being a pleasant surprise for any grower. In a growing room you will need to give it a growth period of 1 to 2 weeks to move to a bloom period of 85 to 95 days offering productions of up to 500 grams per square meter. In the outside, you will have it ready for harvest in early November (northern hemisphere), with yields of up to 550 grams per plant.